This is a variation on Minestrone Soup, but also is reminiscent of Pasta e Fagioli (Soup). I’ve not tried this yet, but I do like the combo of kale, beans and pasta in these other, more familiar soups. 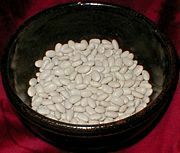 This recipe is adapted from Fine Cooking.com (1). I’ve halved the original recipe. See also another version without the noodles and flavored with rosemary instead of cilantro, also on Fine Cooking.com (2). 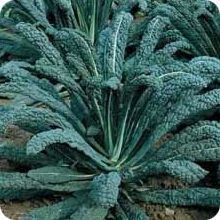 I love lacinato kale (black kale, pictured left, from Incredible Seeds (Canada)), but any kind of kale will do – or a mix of varieties. If you can’t find fresh cilantro don’t settle for dried, as it just doesn’t have the flavor. Use flat-leaf parsley instead, tho it will provide a different flavor entirely. for instructions. 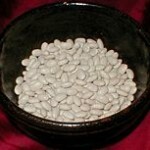 If soaking the beans, start 1 days before making soup; if sprouting beans, start 3 days before. Prep: scrub and chop carrots; chop onion. Remove ribs from kale, then roughly chop kale to yield about 3 cups. Squeeze limes to make 1 – 2 Tbsp juice. Break pasta into 2” – 3” lengths, enough to make 1/2 cup. Soup: Heat 1 Tbsp oil in saucier over medium-high heat. Add carrots and onion, and cook until soft and just golden, about 10 minutes, stirring occasionally. Scrap into a bowl and set aside. Add remaining 1 Tbsp oil and warm. Add pasta and cook stirring often, until golden, 3 – 4 minutes. Add broth and stir, scraping bottom to release stuck-on pasta. Add carrot/onion mixture, kale lime juice, and ¼ tsp salt, ⅛ tsp pepper. Bring to a boil. Lower heat and simmer until veggies and pasta are tender, about 10 minutes. Remove from heat; stir in cilantro and adjust seasoning with more lime juice, salt and pepper. This entry was posted in Citrus, Fat or oil, Herbs, Leafy Veggie, Legumes, Onion family, Pasta, Root Veggie, Simmered, Soaked, Sprouted, Stock, broth and tagged broth, carrots, cilantro, kale, lime, onion, pasta, stock, white beans. Bookmark the permalink.